In a previous contribution to The Post, titled ‘Unanswered questions’ (March 1, 2014), I had raised five questions regarding the way of life under secularism in Nepal. With the recent election results in India, where the Bharatiya Janata Party-led (BJP) National Democratic Alliance (NDA) secured a majority on a scale not seen in an Indian election since 1984, another question has arisen: will the BJP-led government under Narenda Modi help reinstate Nepal as a Hindu country? Although analysts like Kanak Mani Dixit have rejected this possibility, there is yet some speculation among the intelligentsia. Prior to the Rastriya Prajatantra Party-Nepal’s (RPP-N) convention, party chief Kamal Thapa had hinted that they would first advocate for a Hindu nation, then on reinstating the monarchy. However, during the convention RPP-N identified itself as a pro-Hindu, pro-monarchy party and depicted the CPN-UML as “opportunist”, the Nepali Congress as “directionless” and the UCPN (Maoist) as a party with a dual mentality. Thapa did not seem to realise that “opportunist, directionless and dual mentality” are the attributes of every Nepali political party and his party is no exception. In some occasion, Thapa has raised a strong voice in favour of the monarchy but at same time, he does not hesitate to argue that he is more focused on reestablishing Nepal as a Hindu state. This shows that Thapa himself is sandwiched between ideology and practice. It also wouldn’t be remiss to say that the RPP-N itself was opportunist during the November election campaigning and emerged as the fourth largest party on an anti-secularism plank. Beside Kamal Thapa ’s RPP-N, no other political party openly advocated against secularism. However, during the November Constituent Assembly (CA) election, the political manifestos of the UML and the NC did not display a clear direction on secularism. Although their manifestos weren’t convincing about their commitment to securalsim, they were nevertheless successful in creating a vibe, which neither denied secularism nor accepted it in totality and kept people guessing. Thus, it seems both the UML and NC have adopted a ‘turtle walk’ policy. When it comes to the UCPN (Maoist), it claims that secularism was its political agenda. After Nepal was declared a secular state, on two separate occasions, the Maoist assumed leadership of government. When Prachanda was prime minister, in name of a ‘cultural revolution’, he interfered in the appointment of priests at Pashupatinath temple, which was heavily criticised at home and across the border. Similarly when Baburam Bhattarai was Finance Minister, he attempted to cut government funding for religious events, particularly during Indra Jatra, in 2008 in consideration of secularism. Although the Maoists advocated for secularism and a kind of cultural revolution, they were not able to take radical steps when in power. Even during the drafting of the constitution, they have been unable to initiate a debate on the model of a secular state, which is unfortunate. In 2010, the Supreme Court touched some aspects of secularism in the aforementioned Pashupatinath case. After the results of the first CA election, the Prachanda-led government appointed Nepali priests to Pashupatinath temple, breaking with the old tradition of appointing Bhatta priests from South India. Protests erupted in Nepal and India, which were supported by the BJP. In one Public Interest Ligitation (PIL) case, Lok Dhoj Thapa and Binod Phunyal v Prime Minister and Patron of Pashupati Area Development Trust and Others, the petitioners claimed that the attack on the structure of Pashupatinath and the Pashupati Area Development Trust (PADT) was unconstitutional and against the principle of secularism enshrined in the Interim Constitution. In its judgment, the Supreme Court did not go into detail on secularism but touched on the issue. The Court emphasised reform of the Pashupati area and asked for a detailed plan dealing with the worship, priests and the guthi of Pashupatinath in accordance with the values of a secular state. The Court suggested taking India, a secular state with a Hindu majority, as an example for Nepal to study secularism. Considering Nepal’s relatively new status as a secular state, the Court’s call for an expert committee to study the situation and make recommendations was understandable. However, I believe that the Court lost an opportunity to speak more on the issue. Similarly, in Pun Devi Maharjan v Office of Prime Minister and Council of Minister and others, the Kumari practice was challenged on the grounds that the fundamental rights of the children who were Kumaris were violated and that the state should take appropriate steps to address their plight. Although the case was filed before Nepal turned into secular state, the judgment was pronounced after. But again, the Court missed out on an important opportunity to define the kind of secular state that Nepal would become. The primary question here is what model of securalsim are we adopting? In the previous CA, the preliminary draft of the CA Committee for Fundamental Rights and Directive Principles proposed changing the language of the Right to Religious Freedom in the Interim Constitution, which states, “Every person shall have the right to profess, practice and preserve his or her own religion as handed down to him or her from ancient times paying due regard to social and cultural traditions”. But the CA committee proposed changes so as to read, “Every person shall have the freedom to profess practice and preserve his or her own religion in accordance with his or her faith or to refrain from any religion”. This means that the previous committee didn’t limit itself to the traditional definition of right to religious freedom, indicating also the freedom to refuse to take part in any religion. 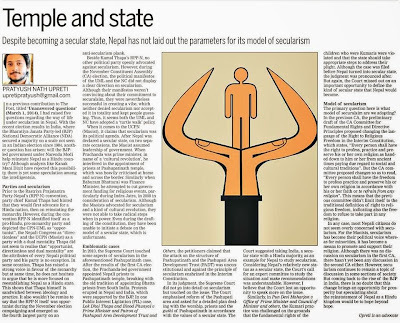 In any case, most Nepali citizens do not seem overly concerned with secularism. For the Maoists, secularism has become their political voice whereas for minorities, it has become a means to promote and support their religion. Although there was no discussion on secularism in the first CA, there hasn’t yet been any discussion in the second CA either. However, secularism continues to remain a topic of discussion in some sections of society. But coming back to the rise of the BJP in India, there is no doubt that this change brings an opportunity for prosperity but speculating about the reinstatement of Nepal as a Hindu kingdom would be to hope beyond hope.